For the common enthusiast or the professional player, darts is an engaging, lively game to be enjoyed with all your friends and family. Not only does it require the precision and accuracy of your throw, you also have to keep your points calculations in check while competing with others or playing alone. However, choosing the best dart board can be a chore, so here we break down on the top dart board brands, their pros and cons and what makes each special in their own way. 6 Darts, Metal Grid, Hanging Hook, Aluminum Frame. Bluetooth enabled, App for both Android and iOS, Universal player database. Cheap, Attractive Graphic Surface, Brass Tipped Darts. Easy to set up, Cheap. What Dartboard Do Professionals Use? What Are Dart Boards Made Of? One of the bestselling darts boards in the market, Winmau is back with another dartboard of superior quality. Winmau Dart Boards are always a premium product; innovative staple free design developed in 1997 is present here, continuing its legacy. The dartboard is quality and good value combined for a great experience, thus known as the best professional dart board. The board boasts of using a Rota-Lock- a system causing setup and attaching it anywhere a breeze. The ease in rotation can also lead to rise in lifetime of the board, as the board’s fibers can heal better. At 4.8 KGs and 17.8x17.8x1.5 inches, it is a regulation dartboard which has also been certified by the British Dart Organization (BDO). With an intricate wiring system which is a big advancement from the very popular Blade 4 series, it is a dartboard with a lot of promise. It is the best dartboard on the market at this time. Great durability, does not wear out with long term use. Fully professional dartboard with all regulations and measurements perfectly suited for a professional darts player. Bounce-outs are reduced with renewed technology and darts are deflected more onto the scoring area. There is a lack of dual core. Viper Dartboards are one of the most popular dartboards you will see. An innovative creation of GLD Products, who have been in this line of business since the 1800s, the Viper dartboards are often used in tournaments which obey the regulations set by the PDC. The sisal fibers are rounded out, to reduce outward deflection. The ultimate dartboard to withstand your relentless darting, it is certainly one of the best buys in terms of the top dartboards. Comes at 18” in diameter, and is 1.5” thick. Also included in the set are a Cricket Scoreboard, writing accessories, mounting materials, and a set of darts. It’s weighed at 4.8 KGs; and can be used for both steel and soft darts. This board is also absolutely staple free. The amount of abuse it can withstand is a surprise to many-and it is renowned for looking brand new even after months of tough usage. 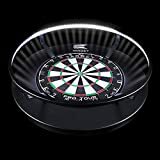 This is the best steel tip dart board, it can be used for tournaments and practice alike. The number ring in the Viper Shot King can be removed which can allow the sisal fibers to heal, thus increasing durability. The bulls-eye is staple-free, thus if you hit the bulls-eye, don’t worry about the dart bouncing out. Darts coming along with the set are not durable, and wear out easily. The support on which the dartboard remains may be unstable on some surfaces. The best selling electronic dartboard, the cricket score-esque display makes it look very pleasing to the eye. Arachnid dart boards are considered the premier producer of the electronic dartboards, and is well known throughout the world for producing the most innovative and quality electronic dartboards in the world. The Pro 800 is one of their best creations to date and is a thorough bestseller. The Arachnid Cricket Pro 800 weighs at 4.5 KGs, with the dimensions 30x22x3 inches. The wide variety of game modes available, as well as a ranking system keeps you coming back to play a game over and over again. The technology behind it is quite advanced. The Arachnid Pro 800 even monitors your game and can give you your PPD(Points Per Dart) average, which is very convenient and a fabulous addition. Another cool feature is the Heckler- it will admire you for good throws, while troll you incessantly for a ridiculous one. Surely one of the best home electronic dart board available in the market now, but widely used for game rooms too. It has good durability, with the company advertised NylonTough segments. The score display is very interactive and is very appealing to the eye. Auto calculation of scores and points on the display so you don’t have to note down your scores all the time. Up to 8 players can play, at the same time. Targets are a bit larger thus this dartboard would be great if you are just starting out and are a greenhorn. May seem a bit easier in difficulty to some players. Requires a constant supply of electricity. This is the era of communication. And smartphones are everywhere. Nowadays, mobile phones aren’t about just talking and contacting. I mean, you can do tons of work that once needed a computer to do. If that’s how technology influenced our life, why not dart boards? Gran board dart board is an app driven board that can be tracked by Bluetooth. You can use the app with both android and Apple’s iOS. The app shows command in English, so it should be easy as a pie to use it. One thing about the app is, it is made to enable precision and clear data. You can store player’s name, scores, averages and other necessary information. As for the board, it’s a compact yet sophisticated board. The dimension is 23.8 x 23.5 x 2.6 inches while being only 8.11 pounds in weight. Home or outside, you can use this board with convenience. The display board doesn’t produce sound thanks to the foam installed. The board comes with Bluetooth 4.0, also known as the smart technology since it’s the latest Bluetooth technology. This is a cordless dart board. This makes it easy to setup at homes, offices, party and other social gatherings. The connection process with the phone is easy. You just have to turn on the power button and it will connect with the app automatically. There is a newer model that comes with improved features. If you are looking for quality Bluetooth Electronic dartboards, Gran Board 3 LED Bluetooth Dartboard can be a great option. This is a cordless dart board that comes with two powerful AA batteries. You can carry it with ease and start a game with your friends. The segments of this board has foam inserted, which helps with controlling the sound. The colored LED front lets you see the board with ease. The scoring can be stored on the phone. What amazing is, you can compete with other players since the app maintains a worldwide database. The Bluetooth controlling and the app makes it a dartboard of modern era. You will have to purchase the batteries separately. However, what comforting is they shouldn’t cost much. From one of the best dart board brands, Fat Cat ELectronx Dartboard is an exquisite electronic dartboard available for purchase. One of the top rated dart boards, it is well-designed to give you a great darting experience. It includes 6 darts, 6 spare tips, along with mounting materials as well as a manual and, as the name suggests, a cabinet as well. The cabinet can even store 4 sets of darts. This is by far the best dart board cabinet provided by any manufacturer. The Electronx boasts of increased durability with thermoplastic components which increase its lifetime by a mile. Bounce-outs are also reduced due to the very thin spider wiring used for the board. Weighed at 5.5 KGs, and with dimensions of 20.2 x 1.5 x 24.8 inches, it is a robust dartboard which will look great in your game room. The LCD display is also very attractive and the big digital buttons make it easy to navigate and operate. It is one of the best soft tip dart boards with cabinet; making it a great buy. Up to 8 players can play at the same time, with the intricately designed LCD display being able to display the scores and winners quite easily. Options for at least 38 game modes, with 167 variants, so a lot to experiment and play with the dartboard. You could play solo or cyber-play is possible, with 5 different difficulties available, from novice to professional. Comes with a good warranty, thus ensuring you of the longevity and service you can get with the board. Darts which come with the board wear out easily. Want a safe game of darts with no worry of anyone getting hurt or your walls getting damaged? Maybe you are looking for a good pastime for your kids to drag them out of those TV screens. Well, Marky Sparky has for you the Doinkit Darts-a dartboard with a host of strong magnets for keeping your darts in place. It is one of the top rated magnetic dart boards available in the market- and is great for all ages and all skill levels as well. It is also considered by many as the best home dart board, the attractive colors and light design make it a nice addition to add to your décor. Weighing at just 0.4 KGs, and with the dimensions 16.8 x 15.8 x 1.6 inches, Doinkit Dart Board is a lightweight but sturdy, durable dartboard designed for longtime use and for some great fun for friends and family. Coming in attractive colors, it has a set of 6 darts, 3 each of different colors. The Doinkit Darts magnetic dartboard comes with a hook which allows it to be hanged easily anywhere. It’s quite durable- the neodymium magnets increase the strength and lifetime of the board. Magnetic darts are safe and there is less risk of injury, and people of all ages can play. The magnetic darts are not harmful for your walls so you don’t need to worry about wall damage. Quality of darts could be better, they might feel light in the hands. Magnets can get weaker over a period of time. Fun Adams Magnetic Dart Board have done a great job in remaking the classic game of darts and making it much safer, and child friendly. It is easily one of the best magnetic dartboards in the market and is prevalent in many top dartboard lists throughout the internet. Coming with a set of 6 magnetic darts and wall mount accessories, Fun Adams Dart Board may prove to be your best bet for some family fun. Recommended for both children and adults, it is a wonderful addition to your living room. Aimed at improving your hand-eye coordination, Fun Adams have gone lengths to recreate the game and they have done a good job at it. The dartboard is easy to mount, and it is very easy to just pickup and have a quick game of darts whenever you want. Its dimensions are 16.4 x 16.2 x 1 inches, as well as its weight being a mild 1.28 KGs. Applicable for all age groups-children seem to love it. Darts are well designed-aerodynamics are considered during crafting, so the dart travels through air quite readily. They are safe, won't damage the walls or hurt children. The hook enables hanging and playing it anywhere. Not the regulation size and diameter, so not for the serious enthusiast. Cork dartboards might not be up to the mark when it comes to professional games. Yet it can be a cheap alternative to traditional dart boards. They are lightweight, safe and can be set up literally anywhere. Since they don’t come with heavy materials, children can play around them. The Cummins dart board comes with a custom, eye catching graphic surface. The whitish design will attract anyone at first glance. To set it up properly, the board comes with hanging hook, aluminum frame and metal grid. You can set it up and start playing within a few minutes. It comes with darts too. The six darts included are brass tipped. The flights are printed with national flag theme. There are several ways you can do dart board lighting. You can either purchase a 360 degree lighting enabled dart board. Which is the best option. 360 degree lighting system comes with LED lights around the board. This system casts the light equally and brightly on the board. If you have budget restraint, you can go for separate lighting system. You can install single flashlight. Which is the cheapest option. However, single flashlights can cast shadow on the opposite side of light. This can be solved by multiple lights attached with a lighting system. Considering these facts, we have reviewed 3 best dartboard lightings that come with different setups. The dimension of this lighting system is 27.3 x 27 x 2.2 inches. And comes with a weight of 4.5 pounds. The 360 degree lighting system comes with a whopping 125 LED lights that produces dazzling light regardless of your normal room light. Also, the circular lighting system eliminates the chance of casting any shadow. The structure is made of strong aluminum, which shields the lighting system. The frame is angled in a way which actually increase the lighting impression of the board instead of glaring towards the player. The power is transmitted by a low voltage power cable which can’t be penetrated by darts because of reinforced setup. The dart board also comes with a bracket which helps it secure to the wall. If the wall is uneven, you don’t have to worry because you can lock the board securely thanks to the adjustable feet. You can easily rotate the board by removing the feet. Overall, the lighting system comes with a convenient setup to instantly apply and start playing. The Unicorn comes with a ring to wrap around the dart board. The surround is designed in a way that can fit any standard bristle dartboard. You can also purchase the whole setup along with dart board. The Unicorn Dart Board Light comes with non-glare illumination. Which means you shouldn’t have problem of too shiny light to watch. The front cover is made of strong aluminum and the frame is double injected molded frame. The lighting system comes with batteries or AC adapter. Which means you can choose the one model that is convenient to you. The 3 display lights come with a straight cabinet. The LED lights are well-ordered in a way that delivers crisp light for the player. The setup comes with mounting hardware, so that you don’t have to worry about additional hardware. You can set this up above any flat top dart board. What even more convenient is, you can flip the light in case you want to close the cabinet. The setup can be powered in two ways. And both of these models are available online. Either you can use 4 AA batteries for a constant power supply. Or you can use a 1000 mA, 5V power adapter to run it by electricity. There is a problem with non 360 degree lighting systems that occur pretty often. Lights usually cast a shadow at the opposite side. So you might face problem seeing the board. However, with Viper Shadow Buster, this won’t be the issue. The lights are adjustable and the angle can be changed to yield the best darting experience. In the market, you will see a host of dartboards available- many made of different materials, different technology. Quality dartboards are available- and you will obviously want the best out of your money. Cork dartboards, paper dartboards sometimes fall short of ‘best’. A cork dartboard might frequently reject your dart. It may be deflected off the board itself, and that is quite annoying. However, if you’re buying the board for occasional play or for kids, they will do just fine. Bristle dartboards will accept your dart more readily thanks to the fibre properties, and the technologies behind it. Each brand has its own technology behind its dartboard, and each brand produces dartboards for a specific type of player. Would you like the traditional dartboard? Or a more advanced electronic one? Or maybe you would just enjoy a game using magnetic darts. It’s all about personal preference, but you have to be on the lookout on the top dartboard that suits your game. Which type goes with you? It’s about your personal preference- an electronic dartboard may be the best for you if you just want to pick up and play. A bristle dartboard would be ideal if you want a real challenge and have aspirations to actually become a pro someday. We hope this guide can help you get the ideal and best dart board you would love to spend time with. Bristle Dartboards is one of the most common dartboards available. It Is made of a sisal fiber, which comes from a sisal plant. Basically, the main advantage of this type of dartboard is its magnificent durability. When you throw a dart, the hole which opens due to the dart is instantly closed once the dart is taken out. Thus, it takes a long time for the dartboard to wear out and break. They are also quite cheap; thus making a good choice. However, buying a less priced dartboard may lead to having protruding wiring. Which means, if a dart thrown hits, sometimes bounce out instead of striking it. This is a very slight disadvantage; otherwise, the bristle dartboards make for a good buy. Electronic dartboards are growing more and more in popularity. Also known as soft-tip darts, the electronic dartboards are a much more watered down version of the original game. Thousands of holes are present on the surface of play, and when one of your darts enters one of the holes, your score is recorded. As you already would have understood, the small surface leads to bigger target holes, thus leading to higher scores-thus being the love of many novice dart players. You also don’t have to calculate your score. The dartboard calculates it for you, leading to less pressure on you in the arithmetic sense. As for pricing, electronic dartboards may be a slightly more expensive, but depending on the size and type of display, the price varies. It is a good buy, but many may not feel the historical essence of darts from electronic darts, but since it is available in almost every arcade and bar nowadays, it is one of the common dartboards you are likely to encounter. Another type of dartboard you are likely to encounter; these are Magnetic Dartboards. As the name suggests, they are dartboards created with metallic material on which the magnetic-tipped darts stick. It is definitely not for dart professionals and more likely considered a toy. The size of the dartboard is also something to look out for-the target area can be from 13.5 to 18 inches, while the regulation size of a dartboard is kept as 17.75 inches in diameter. Dartboard dimensions must be considered during purchase, as it is a key point to consider if you have the wish to participate in tournaments in the future. Now, as for your budget, there are some types of dartboards, like the cork dartboards and coiled paper dartboards which are very cheap. But they are low in durability that it would be touted as a waste considering you are going to get minimal playtime from them. Good quality bristle dartboards are at a moderate price range, often coming with cabinet which can further improve the décor of your game room. Magnetic dartboards are in the similar price level. Electronic dartboards lie in the higher end of the spectrum due to more sophistication and electronics involved. Cheap dartboards are easy to find and buy, but for obvious reasons, do not always give the best service. The best rated dartboards are those which can give you the fun of the game while promising longevity; a good return in terms of your money. One thing which you should consider is your dart skills level. Are you buying a dartboard to practice the sport seriously and are a pro at it? Or are you a novice just keeping one at home for fun? The novices and absolute beginners can try out the electronic dartboards-as mentioned before. They are easier to play and you don’t have to think about your score constantly. However, novices can also buy a bristle dartboard if they really want to become good at this sport anytime in the future. Kids, on the other hand, can just buy Magnetic Dartboards. They are easy to play and are safe, perfect for kids who are going to be darts enthusiasts. As for the experienced players, they would prefer the bristle dartboards more, to hone their skills in the game; all major darts tournaments around the world mainly sport the bristle dartboards, so it would be more sensible for them to end up with a bristle dartboard. Professionals definitely prefer the bristle dartboards, made of the sisal fibers, and most regulation tournaments organized by the WDF, BDO and PDC usually take place with high quality bristle dartboards. We have reviewed the most popular dartboards, which have had the most consumer satisfaction. These are from the best dartboard brands available in the market. Different best quality dart boards from are shown here, each classified in their own respective categories. Darts, which originated in Manchester, UK, was initially a game played throwing small arrows at a disc. Gaining popularity worldwide, the game spread to the rest of Europe and North America, and was modernized into the form it is today-small metallic, objects(darts) thrown into a board (a dart board) which has numbers and scores written on them. Dartboards have evolved over the years, and the best dartboards now have such high quality technology and wiring systems, it simply is a testament to the advancement of dartboards today. The rules of the game are further elaborated down below. A competitive game of darts may look simple at best. Here we are talking about the normal way of playing darts. All dartboards are split into several individual sections, with each section having different number of points assigned to them from numbers 1-20, which is visible on top of each. Now, if your dart lands on the black or yellow sections of the board, you will get exactly the same number of points assigned to that particular section. If you hit the black or yellow patches in the number 10, you would get 10 points. These are single-point areas. However, you will see red and green small patches as well; one set of patches nearer to the center of the board while another set of patches are outer. If a dart is thrown into an outer green/red patch, you would get double the points assigned to that section. When you hit the inner green/red patch, you would end up getting triple the points assigned to that section. And finally, you have the center of the board, which is known as the bullseye. If the dart falls on the green part of the bullseye, you get 25 points-if you can hit the red circle, you will end up getting 50 points. Dartboard distance also has to be maintained- a line the player must stand behind. It is 2.4metres behind the dartboard- known as the Oche. If you want to know about how to play dart and its different variations in details, go through this awesome article. First of all, to make your dartboard last a longer time, don’t buy one which is way too cheap. When you have purchased the dartboard, remember to put it in a stable position and keep it safe from falls from heights. For bristle and electronic dartboards alike, you have to be sure to never soak the dartboard in water. It would be calamitous to do so. A bristle dartboard would swell and go out of proportion while an electronic dartboard might not start up again. When using a bristle dartboard, make sure the darts are sharp. Blunt darts will only add to the wear of the dartboard over time. Many dartboards allow you to rotate the board by removing the wiring. It is a good method which ensures longer lifetime for the board, as the damage to the board will be distributed more equally. Best dartboards usually have that feature. The penultimate tip would be to never hang or put something on the dartboard. That will lead to more pressure on the joints on which the dartboard hangs upon and will only shorten its lifespan with passing time. Avoid using your dartboard as your coat-hanger as well. Dart board cabinets are also a good way to preserve your dartboard. It can also give you an additional benefit- protecting your walls from damage as well. The dart regulation authority has defined the regulation height for a dart board. All professional darts corporation tournaments have to follow this exact measurement. The proper height of dartboard bullseye from the floor is 5 feet 8 inches or 68 inches or 1.73 meters. But there is also another dartboard height for people with wheelchair. World disability dart association proposed a wheelchair setup guideline and declared the height of a dartboard from the floor should be 4.5 feet. The world dart foundation also approved this regulation. The height of dartboard is not same for every tournament or league all over the world. We see different rules for different types of dartboards too. For example, in the UK, the measurement and setup are different for regional dartboards like Yorkshire dartboard, London fives dartboard, Ipswich fives dartboard, Manchester dartboard, Lincolnshire dartboard, and others. There are usually three types of dartboard available in the market: bristle dartboard, electronic dartboard & magnetic dartboard. Each one of them is made of different material. Bristle dartboards are made of sisal fiber which comes from sisal plant. A high density of sisal fiber are compressed into a sturdy dart board. When you remove the dart from the board, the fiber will expand again and heal the hole. There will be no visible damage. Bristle dartboards are made for steel tip darts. Electronic dart boards usually made with plastic or similar material. Soft tip darts are played in the electronic dartboard. Magnetic dartboard surface is made of metal or material with magnetic properties on which the magnetic tip darts stick. Apart from these, you’ll find cork dart boards which is cheap, not high quality, but will serve well if you play occasionally. Darts is a great game to play in your leisure time; and it always encourages healthy competition. Whether you are a seasonal player or professional-a dartboard game is always fun. What Is Soft Tips Darts ?